Reader Submission: Haunted Train Ride at the Cincinnati Zoo? These pictures come to us from Rebeckah. 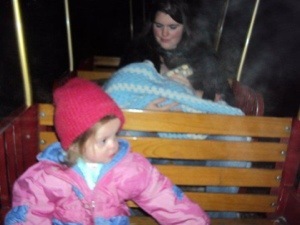 She was on the train at the Cincinnati Zoo during the Festival of Lights in 2010, and noticed something in some pictures taken during the ride. Here’s what she says about it. I’m not sure if you try to prove or disprove any submissions that are made but I will give you as much detail as I can remember. It was very cold that night and when the pictures were taken and we were riding on the train. The first picture is the one taken that my daughter is facing the camera and the second was taken a few seconds later. Many who have seen these agree that it almost looks like a figure sitting next to me with it’s arm around me and I’ll admit I got creeped out then I got home and first loaded the pictures off of the digital camera. I’ve heard that the zoo is believed to be haunted but other than the pictures themselves I don’t recall any unusual occurrences or feelings from that night. Do you think it might have not been something at the zoo, but something attached to them personally? Looks like your daughter’s breath. Please–there is no one sitting next to you.